the union of the many. Each one is indispensable to the whole. To support the development of the International Zone and the emergence of the national/cultural pavilions in the spirit of collaboration and equality, holding the participation of all nations always in mind. Support in-depth applied research on Human Unity, Unity in Diversity, and Peace. 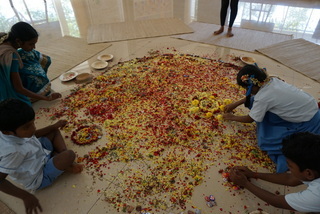 Provide a permanent home for the Peace Table and develop activities around it. Bring more awareness of Auroville to youth in the world and support their participation. Unity Pavilion hosts the International Zone Group, providing office space and holding regular weekly meetings, wherein all pavilion groups and others who are interested are invited to participate. About 10 pavilion groups presently use the office space for displaying books and materials. Since its completion, the main Unity Hall has been used by the pavilion groups for cultural events, exhibitions and meetings. The facilities are also extended to countries which do not have any significant presence in Auroville at the moment. Unity Pavilion also directly supports pavilion groups such as the Africa House, where it is clear that joint support is needed and welcome. Unity Pavilion in collaboration with the respective pavilion groups receives Ambassadors and other eminent personalities from different countries who come to visit Auroville or Pondicherry. Unity Pavilion supports research on topics such as Human Unity, World Peace, East West Relations, Sustainable Development and Human Potential. In these areas of study, the Unity Pavilion invites participation of experts, individuals and groups, who can interact with Auroville through lectures, seminars and artistic creations. It participates in the research towards finding “the soul of each nation” and the expression of its “dharma” – its true place in the world, as a part of the development of humanity, society and the next step in the evolution of life on earth. The Peace Table for Asia, which is one of the six such tables to be placed one in every continent of the world, and conceived as the symbol of world peace and human unity, now has its home in the Hall of Peace at the Unity Pavilion. Once a week and on special occasions group meditations are organized around the Peace Table where all are invited to participate. 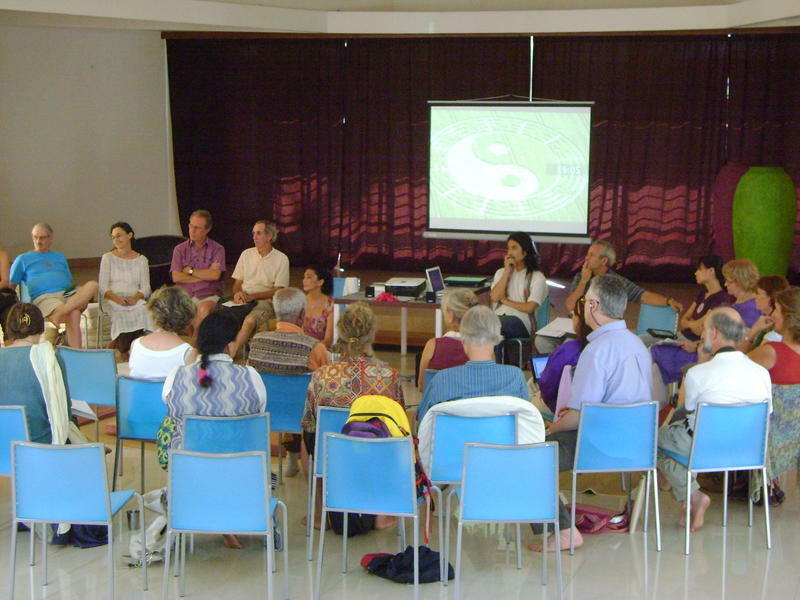 The Hall of Peace in Auroville intends to link up with the other Peace Tables which are presently placed in New York and Moscow and collaborate on joint activities and events. The effort to support young volunteers, which started at Unity Pavilion, has now developed its own organization, Savi, which is for the time being hosted in Unity Pavilion office. Unity Pavilion has been actively assisting African youth to be able to stay in Auroville as well as helping them in different ways with the creation of a temporary settlement for African students in the International Zone. Events and projects organized by young people get special encouragement to use the Unity Hall. The Unity Pavilion is extensively used by the Auroville community for exhibitions, events, lectures, workshops and meetings. It is appreciated for its friendly and peaceful ambience and the beauty of the building and environment. Unity Pavilion from time to time organizes programs that generate interest in topics related to realizing human unity and also on topics of common interest for Auroville as a whole. Recently International Peace Day (21 September) was celebrated in a big way which saw hundreds of school children and adults participating enthusiastically in the interactive events organized. The stewardship workshops being conducted here for the last three years, guided by Monica Sharma, have been immensely appreciated by the participants from Auroville, India, and the world at large.